The Epoch Times began publishing a stunning series of exclusive articles on January 11th. Each article -- there have been four thus far -- reveals previously undisclosed Congressional testimony of key Spygate suspects. The most intriguing testimony appears to be that of disgraced DOJ official Bruce Ohr. According to Ohr, it would appear that James ("Higher Loyalty") Comey directly lied on multiple occasions about who had funded the "dossier", stating that he had no knowledge that the DNC and the Clinton campaign had paid handsomely for it through the firm Fusion GPS. Under oath, Ohr stated he told FBI officials that the Clinton campaign had funded Steele's activities and that his files should be considered highly suspect. Ohr also shredded the claims that the FBI had not received the "dossier" until Septemer of 2016. Ohr described his meeting with Fusion GPS operative Christopher Steele on July 30, 2016 during which he received the salacious and unverified "dossier". Ohr distributed the file immediately to FBI Deputy Director Andrew McCabe, his FBI lawyer Lisa Page, and -- a short time later -- Peter Strzok. According to Ohr, Adam Schiff and the Democrats' infamous rebuttal memo simply lied about when the FBI first found out about the "dossier". In the memo, which attempted to refute key aspects of the majority's Nunes document, the Democrats stated that the FBI hadn't found out about the "dossier" until September of 2016. The New York Times echoed these false claims. The fact that Schiff, a well-documented liar and leaker, is now the chairman of the House Permanent Select Committee on Intelligence is a scandal of its own. During the month of August, Ohr said he briefed several additional officials on the dossier including the head of the Fraud Unit, Andrew Weissmann and an attorney, Zainab Ahmad. Both Weissman and Ahmad now serve on Robert Mueller's Special Counsel, two more in a long series of conflicts of interest that render Mueller's final report utterly compromised. An additional question is why Ohr would brief Andrew Weissmann in the first place. The latter's purview was fraud, not counterintelligence, and he had no business being read into this investigation. This bizarre briefing makes it appear that Weissmann -- and, by extension, Mueller himself -- were all part of the cabal to influence the 2016 presidential election; and, when that failed, to see President Trump removed from office on fictional charges of "collusion". When I provided [Steele's files] to the FBI, I tried to be clear that this is source information. I don’t know how reliable it is. You’re going to have to check it out and be aware. These guys were hired by somebody relating to—who’s related to the Clinton campaign, and be aware. Ohr also said he described Steele's intense hatred for Trump and that he was “desperate that Donald Trump not get elected”. He also stated that he noted that his wife, Nellie Ohr, was a Fusion GPS contractor and was responsible for helping create the "dossier". All of these disclaimers were apparently ignored by Comey's FBI and completely hidden from the Foreign Intelligence Surveillance Court (which happens to be a felony). Bruce Ohr just threw Comey, McCabe and the rest of the criminals right under the bus. Not only does Ohr confirm the key facts contained in the Nunes memo, he also highlights other information that the FBI unlawfully withheld from the FISC. Although he had disclosed the fact that his wife had worked for Fusion GPS, the FBI chose to conceal this critical fact from the court. 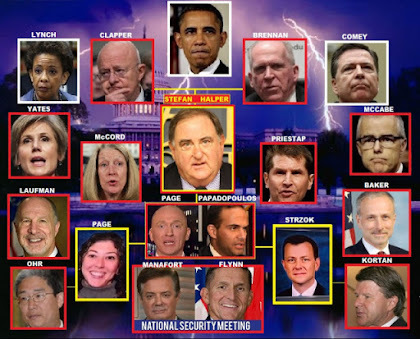 James Comey, Andrew McCabe, Bruce Ohr, Peter Strzok, Lisa Page, Sally Yates and many other key officials related to Obama's thoroughly politicized "Justice Department" are now openly at war with one another. i'm heating up some JiffyPop now. This is gonna get really, really good. Read more at The Timeline Of Treason. Hmmmmmmm, lying to the FBI, failure to report information to the FISA court, collusion to overthrow a standing an legally elected President (sedition). They ARE the definition of a Domestic Enemy. All of them should be in jail or at best hung for treason.... maybe we should consider a military tribunal and have General Flynn officiate.